Posted by The PerfectHouse Team on Friday, December 19th, 2014 at 12:02pm. The PerfectHouse Team is constantly looking for ways to benefit our clients and ensure they are well educated in finance as well as all other areas of the Home Buying process. We accomplish this by partnering with multiple lenders, title companies, attorneys and home inspectors. As new programs emerge we pass on this knowledge for your benefit and incorporate any updates in the services we provide. Take a look at the infographic to the left - mortgage requirements are becoming a little bit less strict - but interest rates are likely on the rise. NOW is the time to GET in the Market! 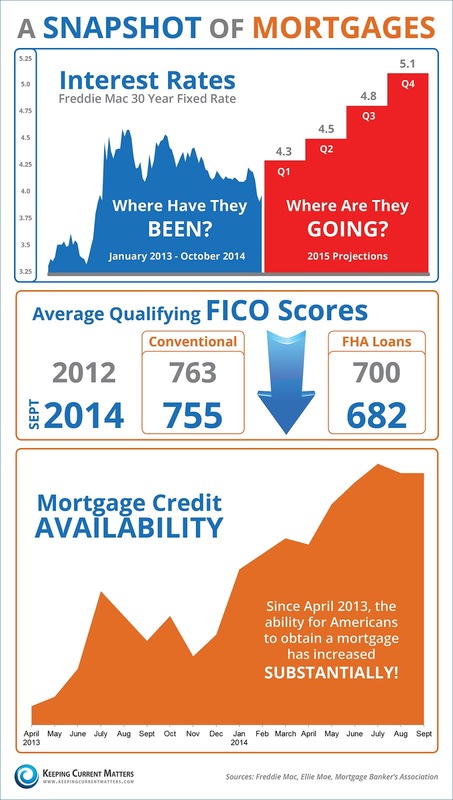 The much publicized 97% Conventional Mortgage is available now at George Mason Mortgage. You might hear of other lenders that may follow as soon as their underwriting, closing and software departments catch up with the new program. Here are the details from Steve Rockefeller at George Mason Mortgage. "In my opinion, this may be a better option for some buyers than the current FHA loan program. Every borrower has different circumstance that may affect what mortgage product they choose," said Steve. This is an exciting development and should bring a new stream of home buyers into the market. This means that people who want to move up should contact us today to discuss the best way to get your ready for the market.